031.AND-OR and Johannes Auer – JavaMuseum 2010 – Celebrate! René Bauer and Beat Suter are founding members of AND-OR. They developed more than 15 projects with AND-OR since 2001. Among them Streamfishing (2004), Gamescape (2005), Searchsongs (2006), Sniff-Jazzbox (2007) and Wardive (2007). 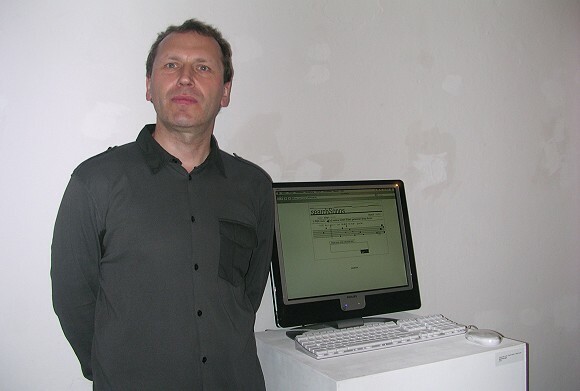 in 2006 AND-OR’s work Streamfishing received an award from the ars electronica. In three of their projects they have been cooperating with the artist Johannes Auer. SearchSongs represents the net’s melody of yearning. It is a collaborative work by Johannes Auer and AND-OR. SearchSongs captures the stream of words of a live search. This stream of words might be understood as an expression of collective desire, as the net’s melody of yearning, which is played by thousands of people, who at any moment try to reach the desired by means of a search engine. This melody of yearning is made audible by SearchSongs. Words contain playable tones of the musical notation system (c, d, e, f, g, a, h, c, fis, ces …). On one side SearchSongs’ web interface shows the stream of words of the live search, on the other side there are lines of musical notes below which transform playable letters in musical notes. Non-playable letters define the length of a tone. n ancient Greece there already was a notation system of letters which was used for indicating the pitch of a tone, and the length of a tone was marked with a symbol written above the letter. A traditioned example is the Seikilos epitaph dated from the second century B.C. The most well known example of a word set to music by a letter notation system is the B-A-C-H motif, which Johann Sebastian Bach repeatedly used in his compositions. 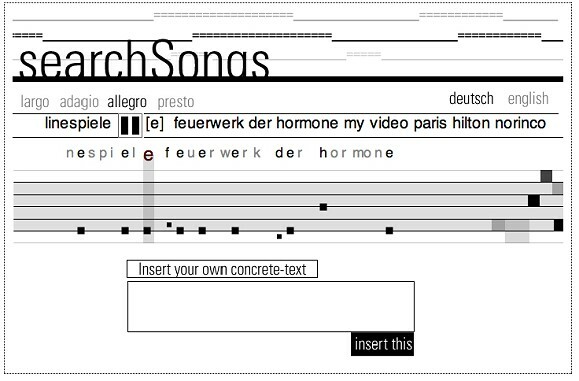 SearchSongs refers to traditional letter notation systems like the Seikilos epitaph and the B-A-C-H motif. SearchSongs accentuates the correlation between letters and notes in a more determined and concrete way. Furthermore the theme of musical improvisation is juxtaposed by a random generator, and the strict rules of the musical notation system is antagonized by algorithme. In this respect at the end the subjective search is being objectivized by the melody of the SearchSongs. However the SearchSongs keep their personal momentum by making it possible for visitors and listeners to interactively insert own words into the stream of words and take part in playing music.